Ramon Llull (Catalan: [rəˈmon ˈʎuʎ]; c. 1232 – c. 1315) (Anglicised Raymond Lully, Raymond Lull; in Latin Raimundus or Raymundus Lullus or Lullius) was a Majorcan writer and philosopher, logician and a Franciscan tertiary. He wrote the first major work of Catalan literature. Recently surfaced manuscripts show him to have anticipated by several centuries prominent work on elections theory. He is sometimes considered a pioneer of computation theory, especially given his influence on Gottfried Leibniz. Llull is well known also as a glossator of Roman Law. Within the Franciscan Order, he is honored as a martyr. He was beatified in 1857 by Pope Pius IX and his feast day was assigned to 30 June and is celebrated by the Third Order of St. Francis. Llull was born into a wealthy family in Palma, the capital of the new Kingdom of Majorca founded by James I of Aragon to integrate politically the recently conquered territories of the Balearic Islands (nowadays part of Spain) in the Crown of Aragon. His parents had come from Catalonia as part of the colonizing efforts for the formerly Almohad island. As the island had been conquered militarily, all the Muslim population who had not been able to flee the conquering Europeans had been enslaved, even though they still constituted a significant portion of the island's population. Llull was well educated, and became the tutor of James II of Aragon. He was conversant in Latin, Catalan, Occitan (both considered the same language at the time as "popular Latin") and Arabic. By 1257 he had married Blanca Picany and they had two children, Domènec and Magdalena; yet despite his family he lived, as before, a troubadour's life. About this time he became the Seneschal (the administrative head of the royal household) to the future King James II of Majorca, a relative of his wife. The vision came to him five times in all. As a consequence of this conversion experience, he took the habit of the Third Order of St. Francis the following year. He left his position and family to live a life of solitude and study for the next nine years. During this time, he learned Arabic from a Muslim slave he purchased. His first major work Art Abreujada d'Atrobar Veritat (The Abbreviated Art of Finding Truth) was written in Catalan and then translated into Latin. He wrote treatises on alchemy and botany, Ars Magna, and Llibre de meravelles. He wrote the romantic novel Blanquerna, the first major work of literature written in Catalan, and perhaps the first European novel. Llull pressed for the study of Arabic and other then-insufficiently studied languages in Spain for the purpose of converting Muslims to Christianity. He even wrote some books in Arabic. Around 1275, Llull designed a method, which he first published in full in his Ars generalis ultima or Ars magna ("The Ultimate General Art", published in 1305), of combining religious and philosophical attributes selected from a number of lists. 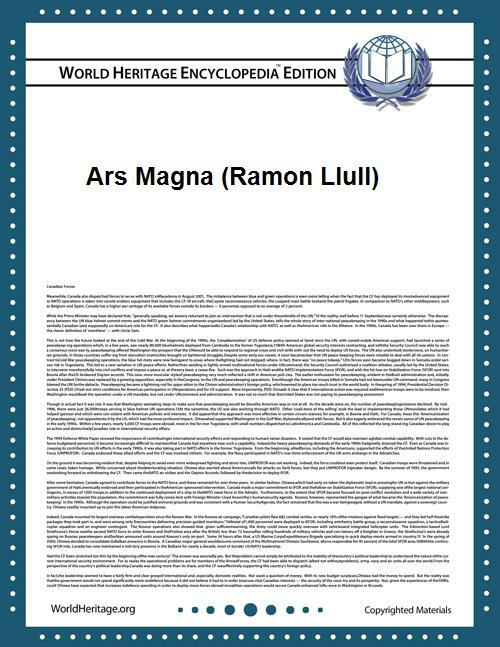 It is believed that Llull's inspiration for the Ars magna came from observing Arab astrologers use a device called a zairja. It was intended as a debating tool for winning Muslims to the Christian faith through logic and reason. Through his detailed analytical efforts, Llull built an in-depth theological reference by which a reader could enter in an argument or question about the Christian faith. The reader would then turn to the appropriate index and page to find the correct answer. Llull also invented numerous 'machines' for the purpose. One method is now called the Lullian Circle, each of which consisted of two or more paper discs inscribed with alphabetical letters or symbols that referred to lists of attributes. The discs could be rotated individually to generate a large number of combinations of ideas. A number of terms, or symbols relating to those terms, were laid around the full circumference of the circle. They were then repeated on an inner circle which could be rotated. These combinations were said to show all possible truth about the subject of the circle. Llull based this on the notion that there were a limited number of basic, undeniable truths in all fields of knowledge, and that we could understand everything about these fields of knowledge by studying combinations of these elemental truths. The method was an early attempt to use logical means to produce knowledge. Llull hoped to show that Christian doctrines could be obtained artificially from a fixed set of preliminary ideas. For example, one of the tables listed the attributes of God: goodness, greatness, eternity, power, wisdom, will, virtue, truth and glory. Llull knew that all believers in the monotheistic religions - whether Jews, Muslims or Christians - would agree with these attributes, giving him a firm platform from which to argue. The idea was developed further by Giordano Bruno in the 16th century, and by Gottfried Leibniz in the 17th century for investigations into the philosophy of science. Leibniz gave Llull's idea the name ars combinatoria, by which it is now often known. Some computer scientists have adopted Llull as a sort of founding father, claiming that his system of logic was the beginning of information science. Llull became a member of the Third Order of Saint Francis founded by Saint Francis of Assisi for lay people. He was not only influenced by Saint Francis but also the Dominican, St. Thomas Aquinas. Because he was married, he could never enter the Franciscans as a friar as some have believed. Retiring to solitude, he spent nine years as a hermit. During that time he wrote on all branches of knowledge, a work which earned him the title "Enlightened Doctor." He traveled through Europe to interest popes, kings and princes in establishing special colleges to prepare future missionaries to convert the infidels of Tunis to Christianity. In 1285, he hoped to embrace a martyr's death and embarked on his first mission to North Africa; he wound up, instead, expelled from Tunis. While Llull was a member of the Franciscan Third Order, founded by Saint Francis of Assisi for lay people, he was not only influenced by Saint Francis and St. Bonaventure but also by the Dominican St. Thomas Aquinas in his development of Scholastic Theology. In the early 14th century, Llull visited North Africa on a reconnaissance mission for a Crusade being planned by the Pope. He returned in 1308, reporting that the conversion of Muslims should be achieved through prayer, not through military force. Llull finally achieved his goal of linguistic education at major universities in 1311 when the Council of Vienne ordered the creation of chairs of Hebrew, Arabic and Chaldean (Aramaic) at the Universities of Bologna, Oxford, Paris, Salamanca, and at the Papal Court. At the age of 82, in 1314, Raymond traveled again to North Africa and an angry crowd of Muslims stoned him in the city of Bougie. Genoese merchants took him back to Mallorca, where he died at home in Palma the next year. Though the traditional date of his death has been 29 June 1315, documents have been found from him which date from December 1315. It can be documented that Llull was buried at the Church of Saint Francis in Mallorca by March 1316. Riber states that the circumstances of his death remain a mystery. Zwemer, the Protestant missionary and academic, accepted the story of martyrdom, as did the article in the Catholic Encyclopedia published in 1911 (see links in the Bibliography). Bonner gives as a reason for Llull's journey to Tunis being the information that its ruler was interested in Christianity—falsely given to the Kings of Sicily and Aragon. His rationalistic mysticism was formally condemned by Pope Gregory XI in 1376 and the condemnation was renewed by Pope Paul IV, though he himself remained in good standing with the Church. Despite this, 100 of his theories were condemned by the inquisitor general, Nicholas Eymerich. Chairs for the propagation of the theories of Llull were set up at the University of Barcelona and the University of Valencia. He is regarded as one of the most influential authors in Catalan; the language is sometimes referred to as la llengua de Llull, as other languages might be referred to as la langue de Molière (French), la lengua de Cervantes (Castilian) or die Sprache Goethes (German). The logo of the Spanish Consejo Superior de Investigaciones Científicas ("Higher Council of Scientific Research") is Llull's Tree of Science. Ramon Llull University, a private university established in Barcelona in 1990, is named for the philosopher. With the 2001 discovery of his lost manuscripts Ars notandi, Ars eleccionis, and Alia ars eleccionis, Llull is given credit for discovering the Borda count and Condorcet criterion, which Jean-Charles de Borda and Nicolas de Condorcet independently discovered centuries later. The terms Llull winner and Llull loser are ideas in contemporary voting systems studies that are named in honor of Llull. Also, Llull is recognized as pioneer of computation theory, especially due to his great influence on Gottfried Leibniz. Llull's systems of organizing concepts using devices such as trees, ladders, and wheels, have been analyzed as classification systems. Ramon Llull also had a strong mystical side, instanced in his work The Book of the Lover and the Beloved, written in order to illuminate weary, sterile souls. He was also interested in, and wrote about, astrology. A synthesis of Llull's work was made by his disciple Thomas Le Myésier, in his Electorium. In the early modern period Bernard de Lavinheta connected Llull with contemporary hermeticism. The inspiration by Ramon Llull's mnemonic graphic cartwheels, reaching into contemporary art and culture, is demonstrated by Daniel Libeskind's architectural construction of the 2003 completed Studio Weil in Port d'Andratx, Majorca. „Studio Weil, a development of the virtuality of these mnemonic wheels which ever center and de-center the universal and the personal, is built to open these circular islands which float like all artwork in the oceans of memory." Paul Auster refers to Llull (as Raymond Lull) in his memoir The Invention of Solitude in the second part, The Book of Memory. Llull, now going under the name 'Cole Hawlings' and revealed to be immortal, is a major character in The Box of Delights, the celebrated children's novel by poet John Masefield. He is also a major influence on the fictional character Zermano in Thomas Salazar's The Day of the Bees, and his name, philosophies, and quotes from his writings appear throughout the novel. In Roberto Bolaño's novel 2666, Amalfitano, a Chilean professor, thinks about "Ramon Llull and his fantastic machine. Fantastic in its uselessness." Adán, Leopoldo Marechal's protagonist of the novel Adán Buenosayres (1948), mentions Ramon Lulio when he walks by the "curtiembre" (leather-tanning shop): He says: "Ramon Lulio, que aconsejaba no rehuir del olor de las letrinas a fin de recordar a menudo lo que da el cuerpo de si mismo en su tan frecuentemente olvidada miseria" (Edición Crítica, Colección Archivos, 1997. Page 312) ("Ramon Llull advised not to shy away from the smell of outhouses, in order not to forget that which the body gives out in its often forgotten misery.") In William Gaddis' first novel, The Recognitions, the final paragraph of Chapter II alludes to "Raymond Lully", as a "scholar, a poet, a missionary, a mystic, and one of the foremost figures in the history of alchemy." Llull is also mentioned in passing in Neil Gaiman's comic-book Calliope, an issue of the DC/Vertigo series The Sandman. In The Commodore, the 17th book in Patrick O'Brian's Aubrey-Maturin series, Stephen Maturin remarks that his daughter "...will learn Spanish, too, Castellano. I am sorry it will not be Catalan, a much finer, older, purer, more mellifluous language, with far greater writers — think of En Ramón Llull — but as Captain Aubrey often says, 'You cannot both have a stitch in time and eat it.'" About another 400 works are doubtfully or spuriously attributed to him. William Theodore Aquila Barber, , London: C.H. Kelly, 1903. Commons has media related to Ramon Llull.